The housing estates of South London have a hidden secret - many feature beautiful railings up-cycled from former ARP Stretchers used in the Second World War. These stretchers were originally made so that Air Raid Protection officers could carry injured people during bombing attacks in the Blitz. Over 600,000 stretchers were built from steel to enable them to be easily disinfected in highly-feared gas attacks. When the war ended there was a large surplus of stretchers and many of London's housing estates had had their original railings removed to serve the war effort. The LCC set about replacing them through clever re-use of the ARP stretchers. 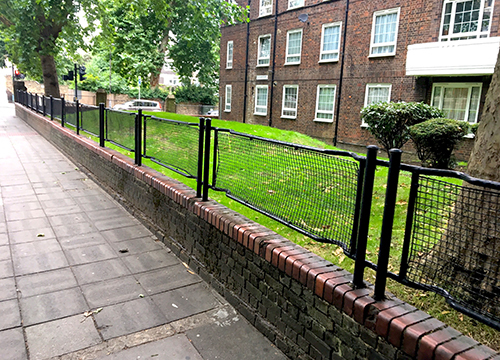 Today there are still many estates in Peckham, Brixton, Deptford, Oval and East London that have surviving stretcher railings, but the railings themselves are often in increasingly poor condition. Some local authorities have removed sets of railings in recent years due to their degradation. The Stretcher Railing Society believes that these railings are an important part of our heritage and should be preserved as an integral element in the fabric of these iconic mid-century housing estates. We are bringing together a team to consult on ways to make this preservation possible. To get involved or to share your stories, follow us on twitter and facebook or email us via the links below.